How should we live? That question was no less urgent for English men and women who lived between the early sixteenth and late eighteenth centuries than for this book's readers. Keith Thomas's masterly exploration of the ways in which people sought to lead fulfilling lives in those centuries between the beginning of the Reformation and the heyday of the Enlightenment illuminates the central values of the period, while casting incidental light on some of the perennial problems of human existence. Consideration of the origins of the modern ideal of human fulfilment and of obstacles to its realization in the early modern period frames an investigation that ranges from work, wealth, and possessions to the pleasures of friendship, family, and sociability. The cult of military prowess, the pursuit of honour and reputation, the nature of religious belief and scepticism, and the desire to be posthumously remembered are all drawn into the discussion, and the views and practices of ordinary people are measured against the opinions of the leading philosophers and theologians of the time. 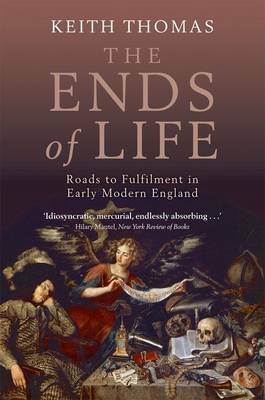 The Ends of Life offers a fresh approach to the history of early modern England, by one of the foremost historians of our time. It also provides modern readers with much food for thought on the problem of how we should live and what goals in life we should pursue.